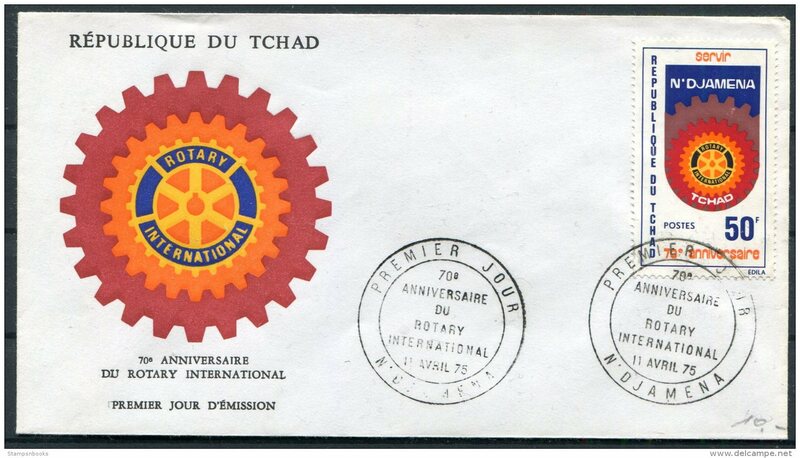 New 1985 Chad/Tchad – 3 Perf m/s on fdc – Daimler Car, Bleriot Aircraft, Paul Harris Rotary. Chad 1973 African Games imperf unmounted mint. 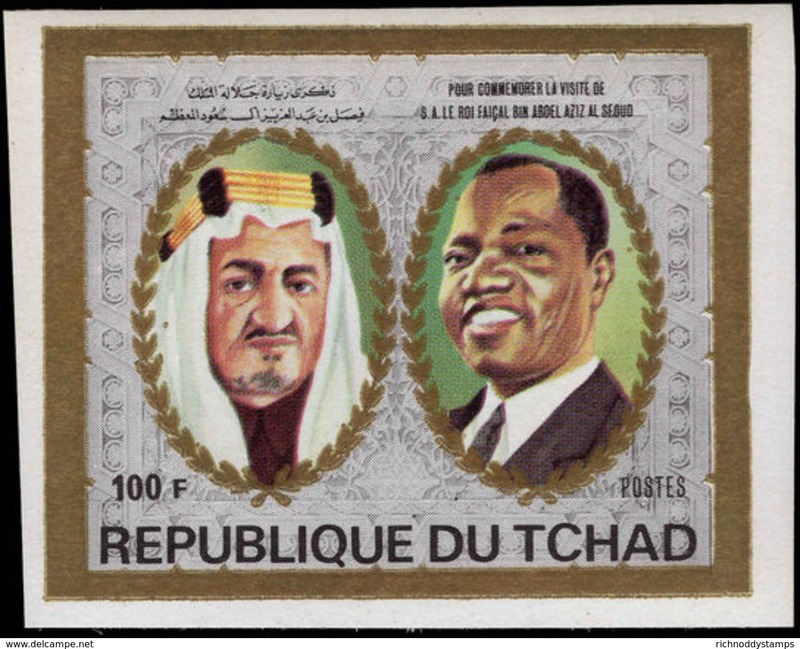 Chad 1972 King Faisal imperf unmounted mint. Chad 1972 Winners Olympics imperf unmounted mint. Chad 1972 Summer Olympics unmounted mint. Chad 1971 Summer Olympics unmounted mint. Chad 1971 Gold medal winners gold foil imperf unmounted mint. Chad 1971 Gold medal winners gold foil perf unmounted mint. 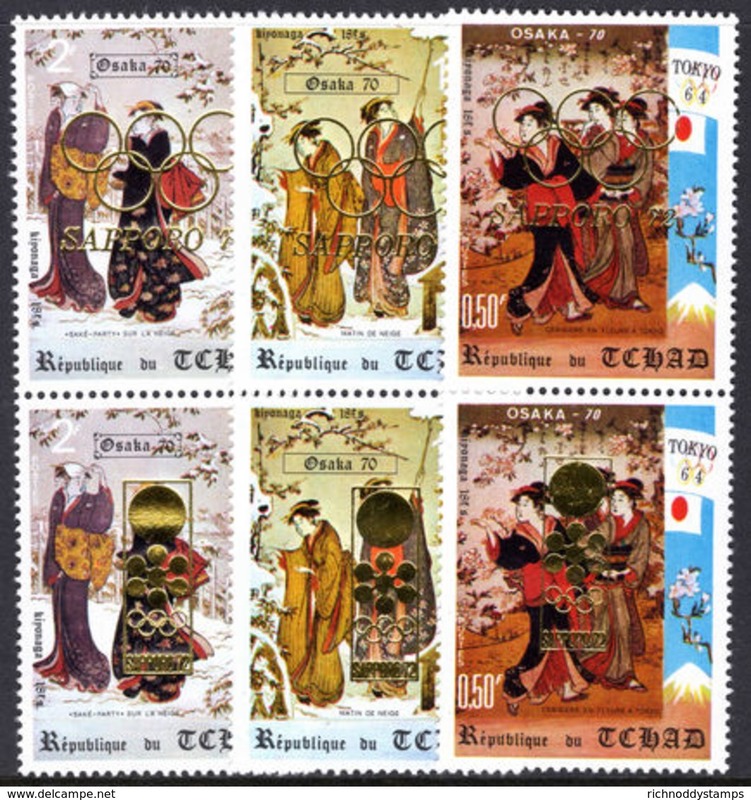 Chad 1971 Winter Olympics gold foil, Sake Party in the snow imperf unmounted mint. Chad 1971 Winter Olympics gold foil, Sake Party in the snow perf unmounted mint. Chad 1971 Winter Olympics gold foil, painting by Kiyonaga unmounted mint. Chad 1970 Munich Olympics Gold Foil imperf unmounted mint. 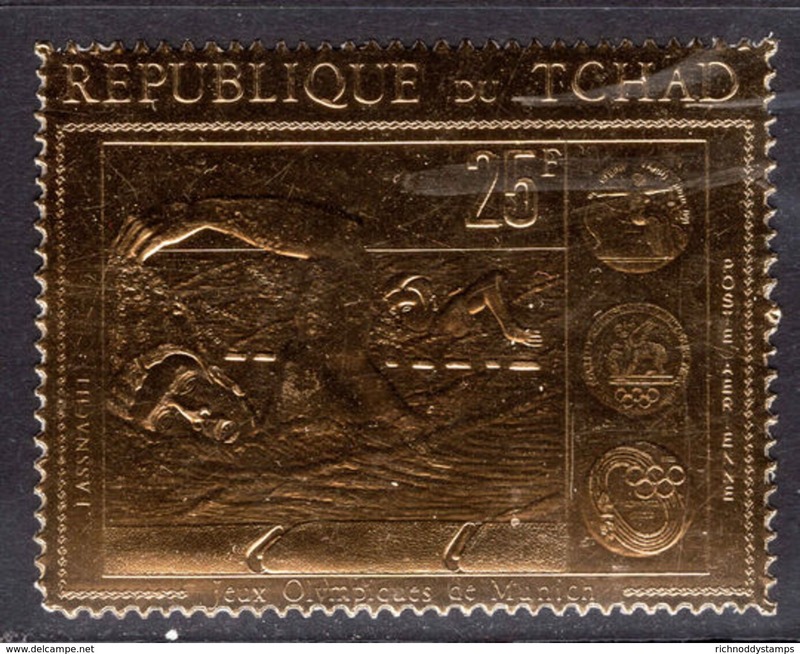 Chad 1970 Munich Olympics Gold Foil perf unmounted mint. Chad 1972 Olympics imperf unmounted mint. 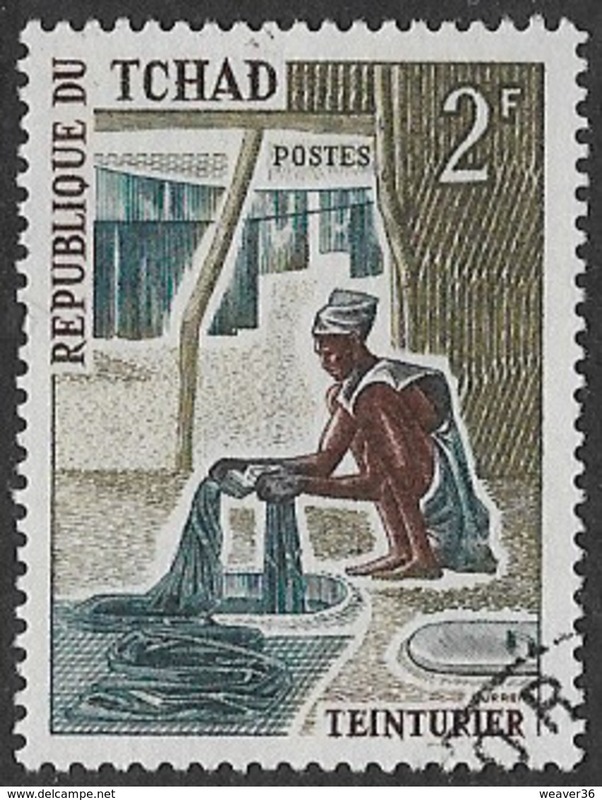 Central African Republic 1979 International Year of the Child imperf unmounted mint. Chad 1960 Olympics unmounted mint. Chad 1969 Moon Landing gold stamp unmounted mint. Chad 1963 Space Telecommunications unmounted mint. 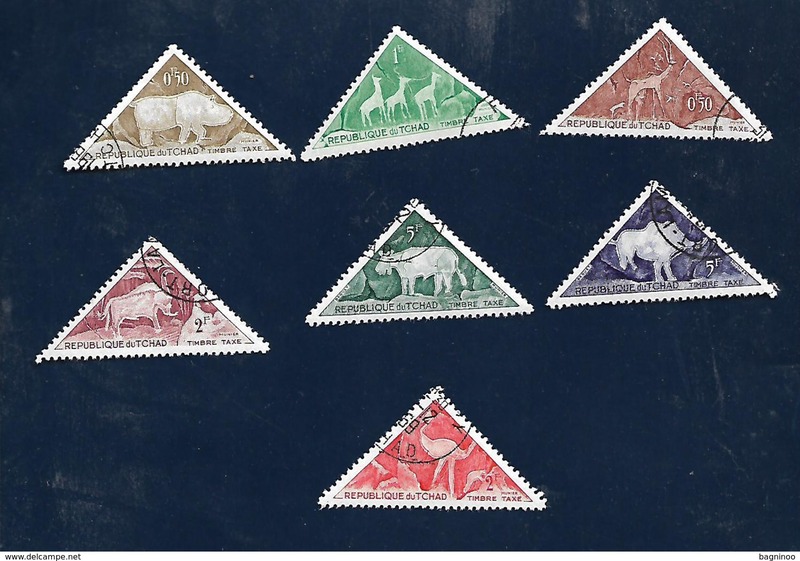 Chad 1971 Scouts unmounted mint. Chad 1971 Famous Black Musicians unmounted mint. Chad 1968 Paintings By Henri Rousseau unmounted mint. Chad 1964 Tokyo Olympics souvenir sheet unmounted mint. 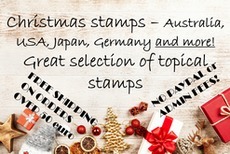 Chad 1962 Cave Paintings Postage Due set unmounted mint. 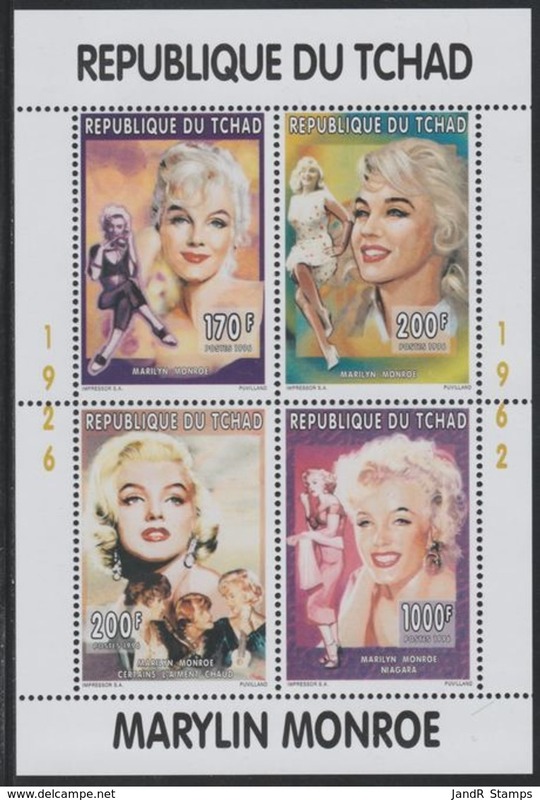 Chad 1961 set unmounted mint. 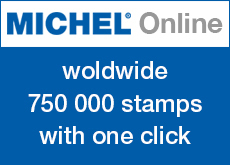 Chad 1971 General de Gaulle unmounted mint. 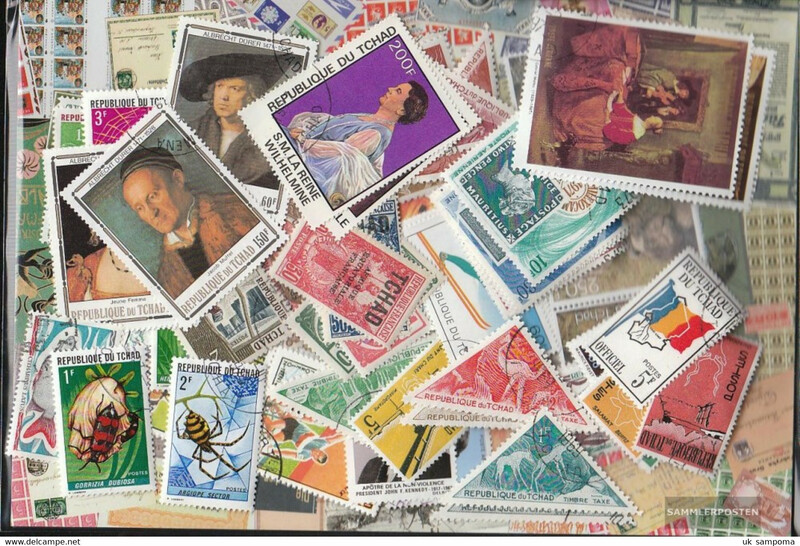 Chad 1982 21st Birthday Of Princess Diana 2nd issue souvenir sheet unmounted mint. Chad 1982 21st Birthday Of Princess Diana second issue unmounted mint. Chad 1982 21st Birthday Of Princess Diana souvenir sheet unmounted mint. Chad 1982 21st Birthday Of Princess Diana unmounted mint. Chad 1976 American Revolution set in single imperf souvenir sheets unmounted mint. 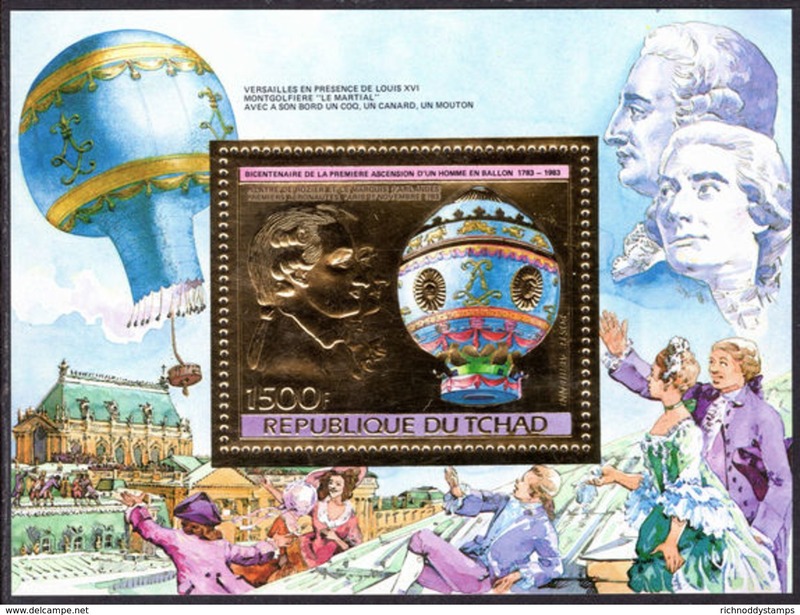 Chad 1983 Montgolier Balloon souvenir sheet unmounted mint. Chad 1982 Olympics Longjump souvenir sheet unmounted mint. Chad 1972 Winter Olympic Gold Overprint unmounted mint. Chad 1979 Viking 250fr inverted overprint unmounted mint. Chad 1972 Winter Olympic Gold Medal Winners imperf set unmounted mint. Chad 1970 Osaka EXPO unmounted mint. Chad 1970 Athens Olympics with Gold Overprint unmounted mint. Chad 1970 Athens Olympics imperf set unmounted mint. Chad 1970 Athens Olympics unmounted mint. Chad 1971 Sapporo Winter Olympics with Gold overprint unmounted mint. 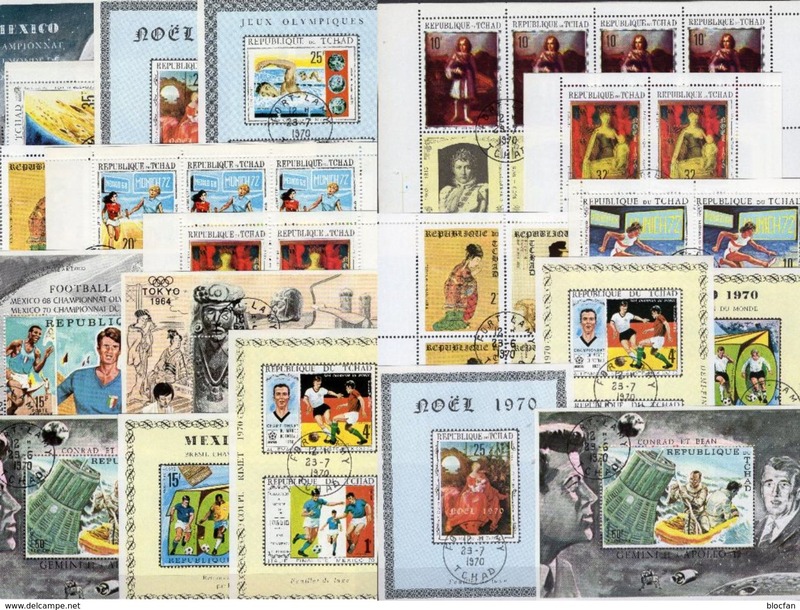 Chad 1972 Olympic Football unmounted mint. Chad 1971 Olympics with without label unmounted mint. 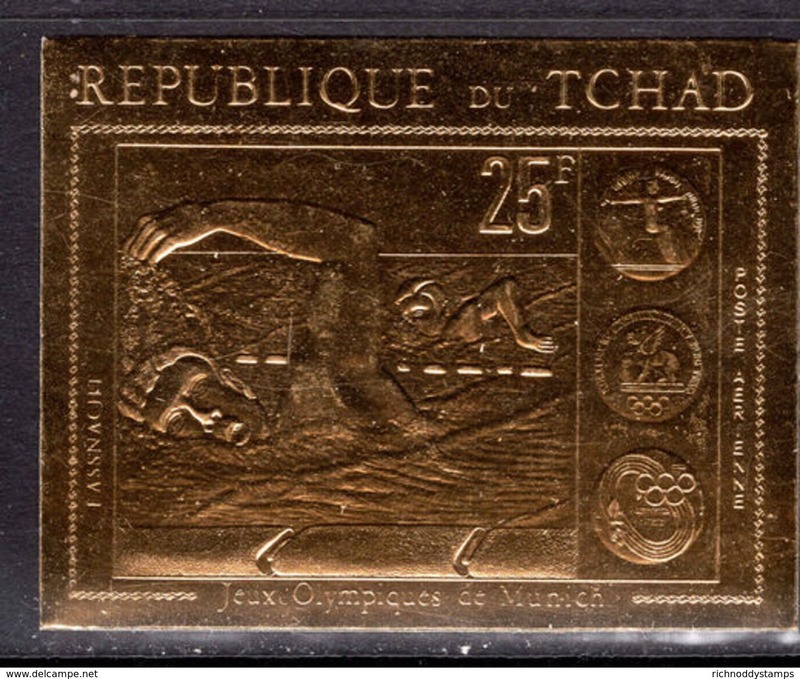 Chad 1971 Olympics with label unmounted mint. Chad 1972 Winners Of the Summer Olympics 1st series imperf set unmounted mint. 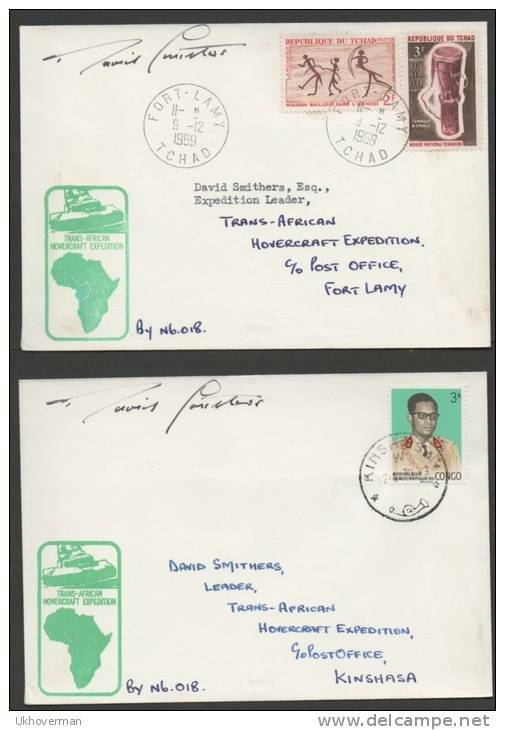 Chad 1971 Great Egtret imperf block Of 4 (Cat £240 as perf) unmounted mint.